That magnificent dome to your left is St Paul's Cathedral. This is the one built by Christopher Wren and was completed on 20 October 1708. What about the other St Paul's Cathedral that I've implied? Well, they were built on the same site long ago but were burnt down one after another before this one was finally built. 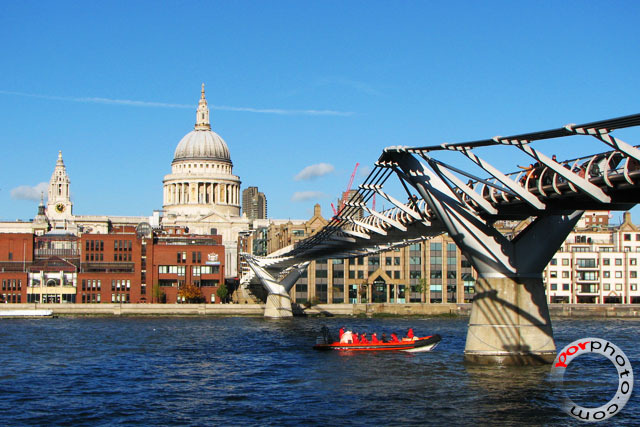 That piece of modern structure to your right that we call a bridge, is The Millennium Bridge. At one time, it was coined 'The Wobbly Bridge'. It was first opened to the public on 10 June 2000, and was closed to the public two days after it opened. The reason... well, it swayed, swung and oscillated too much. It was reopened on 27 February 2002.